RationalPlan Project Management Software version 4.4 is ready for the public. Current version offers support for opening and saving files from/to Google Drive and Dropbox platforms. Plus it was added the possibility to handle Microsoft Project 2013 files along with a new look for the web-based module. Time management is the act of planning, controlling and finally executing specific activities, especially to increase efficiency or productivity. It applies to a wide usage area starting from personal time organization and up to business related time management. For the best results and the biggest efficiency dedicated time management software should be used. A time management system is a combination of processes, tools, techniques, and methods. There are many books and case studies focusing on these notions. The notion of time management was initially used in business related area but in time the term started to also be used for personal activities. People started to be interested on it when they felt the need to be more organized and more productive. It all happens when you start working all day long and at the end you wonder why you haven’t accomplished much. Many experienced project managers have created over time a knowledge base of tips and tricks that they can use. However novices are not that lucky. They need to gain all these in time. In this article we shall try to present some of the most encountered ones. Use of constraints. Constraints on tasks impose certain restrictions in the scheduling algorithm because it relates to certain dates. Fixed dates should be avoided as much as possible since this links the project to a certain time period. Instead of using dates to specify the sequence of tasks you should rather think at adding dependencies between them. Creating dependencies. 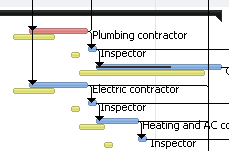 If certain gaps must be created in the sequence of tasks within a project then these should always be represented using dependencies with “leads” or “lags”. This is very useful in case of shifting the project in time. Do not simulate them using false tasks or hard constraints. Using false tasks will result in an increased total work and constraints will make the project to be connected to certain dates. Furthermore dependencies should be avoided to be used to resolve resource overallocations.